Greg Adams played in the NHL in excess of 500 games. You would figure that he would be the best player named Greg Adams in NHL history. Unfortunately that's not quite the case. Greg C. Adams was a solid, physical third line left winger in his hey-day with the Washington Capitals. However his namesake, Greg A. Adams, known affectionately as Gus to much of the hockey world was a goal scorer with the NJ Devils and Vancouver Canucks during the time Greg C. played. Now, if you think its confusing having two guys in the same league with the same name, can you imagine the two of them on the same team? How about the same line? Late in 1989 Greg joined the other Greg Adams (who will be called by his nickname Gus for the rest of this write-up, for simplicity's sake). The deal was struck at the trading deadline between the Edmonton Oilers and the Canucks. The Canucks sent a draft pick and minor leaguer John Leblanc for speedy gritty center Doug Smith and the burly Adams. Adams only played 12 games with the Canucks, but spent some of the time with Gus Adams as his center! That would have been really confusing for Canucks play by play announcer Jim Robson for sure! Greg Adams was born in Duncan, British Columbia in 1960. 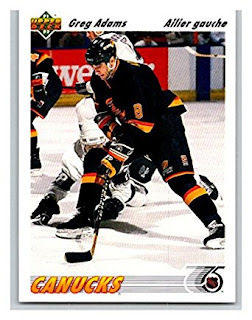 He played his junior hockey down the road with the Victoria Cougars for 2 seasons. Despite scoring 62 goals with 212 PIM in his last year of junior, he was never drafted. The Philadelphia Flyers however offered him a free agent contract. Adams appeared in 39 games with the Flyers but most of his 2 seasons in the organization were spent in the minors. In the summer of 1982 he was part of one of the biggest trades in hockey history as the Flyers sent him, Kenny Linseman and 1st and 3rd round draft picks to Hartford in exchange for Mark Howe and a 3rd round pick. The Whalers were hoping Adams could play the role of tough guy to protect guys like Ron Francis. Adams was a willing fighter but not very good at it. He wasn't big enough to take on the league's heavyweights. Adams was more of a third line mucker and grinder. An honest player who fought hard in the corners and along the boards. The Whalers sent Adams to the Washington Capitals in exchange for tough guy Torrie Robertson the following year. Though the Whalers gave Adams his first full time tour of NHL duty, Adams would welcome the trade to the US capital city before all was said and done. His first two seasons with Washington weren't the greatest. He saw little ice time and even spent some games in the minors. But by 1985-86 Adams had blossomed into a fine NHL third line winger. He enjoyed his finest NHL season scoring 18 goals and 38 assists for 56 points while continuing his robust style of play. Adams put up similar numbers the following season. He scored 14 goals and 30 assists. But by 1987-88 his production had slipped to 15 goals and 12 assists. The Caps would trade him away for a young Geoff Courtnall in the summer of 1988. Adams, never a great skater, didn't fit in well with the Oiler's high flying style and was traded before season's end to Vancouver. He then bounced to Quebec and later Detroit before retiring.